BERLIN, Jan. 29, 2019 /PRNewswire/ -- Bruker today announced the release of the JPK NanoWizard® ULTRA Speed 2 advanced AFM system, which combines highest speed and highest resolution AFM with advanced bio-imaging features. 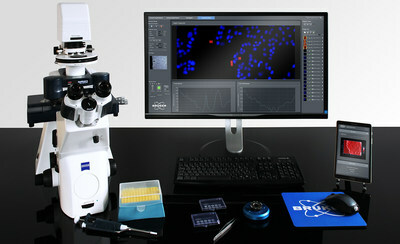 Developed in close collaboration with their expanded worldwide user base, the system is the first new product to come out of Bruker's JPK BioAFM business, formed in July 2018 with the acquisition of JPK Instruments AG. With AFM scanning speed of 10 frames per second, true atomic resolution, and advanced life-science capabilities, the JPK NanoWizard ULTRA Speed 2 raises the bar in technical performance for advanced microscopy applications. The JPKNanoWizard ULTRA Speed 2 comes standard with PeakForce Tapping®, Bruker's exclusive technology that provides unprecedented high-resolution imaging and extends AFM measurements into a range of samples not previously accessed, particularly for soft biological samples. The new system also incorporates JPK's signature Vortis 2 high-speed, high-performance control electronics. Designed to meet the needs of all user levels, Vortis 2 delivers the lowest noise levels and highest speeds of signal processing. A revolutionary new, workflow-based software graphical user interface (GUI) opens a new chapter in easy-to-use AFM operation. The software provides user guidance and user management modules that allow researchers to focus on their experiments, making the JPK NanoWizard ULTRA Speed 2 perfect for multi-user environments or imaging facilities. These features are backed by the widest range of accessories on the market, providing the most application and experiment versatility available for users.